This is not an easy book to review. It is written by an Englishman in his 70's, recording an adventure which encompassed half a century in a remote corner of Western Uganda and Eastern Congo. The author has rightfully earned a reputation thanks to half a dozen novels plus works on travel, ethnology and current affairs. The subject of this book: the Bakonjo tribe and his contribution to their recognition and the acceptance of their leader as a King. "Yet at Kitolu, here, I was aware of the literacy of my civilisation to have become largely blight, a thief of innocence, flouting the right to innocence; the inducer of excess, of a plethora of choice; a tool of power, of vanity and swank, humiliating those without it (however wise) and subjecting too many of those who had it to the ordeal of Tantalus for whom all that tempted him was perpetually in reach but unattainable". His romanticism sometime runs away with him - "I, this white phenomenon with a Konjo honorific, rising out of the plains from an upper world" (my italics). TRIBE can be read at two levels, first as a serious socio-anthropological study, or as a rollicking good yarn in the best Rider Haggard tradition appealing to those who do all their travelling vicariously. The tale it tells is not always easy to follow, either spatially or temporally. The author goes out of his way to insist that his writing "cannot presume to be anthropological in an academic sense". His purpose is "to take any reader by the hand into the mountains and let go of the hand there" (the mountains being the Ruwenzori Range rising to 16,974 ft, in the lower half of which the Bakonjo live, occupying the highest area where cultivation is still possible). It is not always easy to reconcile such commendable modesty with his happy acceptance of the title "Musabuli, he who is lifting out the Bakonjo who are sinking into the swamps ... I was not Jesus as such but Isaya was my Dragoman" (who was later to assume his Royal title) "which I had inadvertently played a part in initiating ... I had released the Jesus factor that lay in him; an obligatory hope, a right to worthwhile martyrdom ... I, an Englishman, am an elder of the Bakonjo (he had now undergone a blood-brotherhood ceremony), now a double tribesman ... Isaya (the King-to-be) and I were indispensable to one another ... I was the initiator and the motivator and the articulator; Isaya delved and conjured". If such words had come from a Colonial Administraor like the reviewer, he would have been accused of typical Colonial paternalism. I had undertaken this review partly because I had been the junior of three such Administrators in the District which is the scene of Stacey's story - albeit 55 years ago. Stacey was only 24 years of age when he first entered Toro District which housed a large part of the Bakonjo who also spilled over into the then Belgian Congo. He had served as a junior British Army Officer in Malaya. He gives the reader a succinct abbreviated history of the Bakonjo. He writes of a "violent protest in 1918 against the Batoro" and indeed against the Colonial Administration. Nothing of that spirit of "protest" was conveyed to me by my masters. Indeed, it was my pleasurable duty, as the junior administrator, to accompany a succession of VIP's to visit the area of the Bakonjo and their intermixed Bambuti pygmies. Perhaps that absence of "protest" could be attributed (though not by Stacey) to the success of the Colonial Administration's lenitive policies? Moreover, an English missionary writing at the end of the 19th century speaks of the Bakonjo as "a very harmless kind of folk who live at peace with all men" (Rev Albert Lloyd in Dwarf Land and Cannibal Country, Fisher Unwin, 1900, p285). As the author criss-crossed the unmarked international boundary accompanied by his "dragoman", he found himself increasingly participating in the life of a favoured tribesman. He shared the hardness of their lives; observed the outcome of the excommunication of a young woman who had had the misfortune of giving birth to twins; lost consciousness during a severe attack of malaria and yet made time to found (as Patron) with his Mukonjo companion (as Secretary, later to be declared King) The Bakonjo Life History Research Society which, much later, had produced on 20 pages of foolscap a Constitution for a new "Ruwenzururu Kingdom". 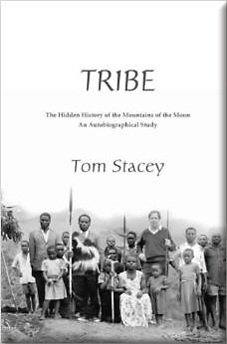 Stacey's first visit to "Ruwenzururu" had been planned as a precursor to writing a novel: that intention was now jettisoned in favour of promoting the interests of his adopted tribe. Shortly after his return to England, Stacey received a letter from Isaya telling him that he had been arrested for "defiance of Toro authority", interpreted by the romantic Stacey as "a sort of willed mini-martyrdom on behalf of his fellow Konjo". On his release Isaya received some support from both the District and the Provincial Commissioners for the suggestion that Bakonjo and the lesser Baamba should be represented in the Rukurato, the Toro Local Government's Council. This was rejected by the Council whereupon Isaya declared himself to be the President of a new "Ruwenzururu Secessionist Movement" - all this within months of Uganda's Independence. And there the author's involvement in this strange saga might well have ended. But in 1963 a completely chance encounter with the Uganda High Commissioner, a Mukonjo, in a London street rekindled his interest. He was asked to find the leader of the "rebellion". "We can't get through to them: we don't know how to find them. Perhaps you could." As a result of this scarcely credible request, Stacey returned to Uganda but was unable to contact Isaya who had established his HQ's over the border in the Congo. Thereafter Stacey lost touch for some 18 years. In 1966 Isaya died and was succeeded by his 14 year old son Charles Wesley. Dramatic changes in Uganda Government ensued; Obote was overthrown by Idi Amin who in turn was replaced by a number of short lived Presidents until Museveni who currently occupies this position. Only now was Charles able to re-establish relations with the Government of Uganda. He was at this time back in the USA working as a manual labourer in a State hospital. He made a brief return to Uganda as did Stacey who visited Ruwenzururu after an interval of 32 years. In 1999 Charles again returned to attend a huge reception. En route he had recorded a broadcast on the BBC African Service arranged by Stacey. He then forewent his opportunity to be formally recognised, and returned to his hospital job in the USA, He had finally demonstrated that after all he was not made of the stuff of Kings. The fire in Stacey's belly now appears finally to have died. Understandably. After an unsuccessful attempt to reach Ruwenzori's highest peak he concludes sadly that Africa (not merely Ruwenzururu) "is a continent incompetently and corruptly governed". He echoes a conversation he had with Charles' father half a century earlier when Isay a, a baptised Christian, had said, "God made Europeans better than Africans in all things". Stacey must at some time have asked himself what was the outcome for his beloved Bakonjo of all his so well intentioned endeavours. Cui bono?? Postscriptum: I attended a lecture by Stacey in February 2004 at the Royal Geographical Society when he gave an illustrated and somewhat jocund account of his Ruwenzururu adventure. He did express some sadness when I spoke with him after the lecture, but was confident, as were half a dozen Bakonjo with him, that Charles Wesley would one day return as King. I wonder if, in the long run, he is serving the best interests of this "very harmless kind of folk". Perhaps those who buy the book can make up their own minds.